Great Britain has developed a unique way of producing prime lamb, a.k.a. market lamb. This breeding scheme is traditionally called a 3-tier system. This stratified system has been perfected over hundreds of years in the United Kingdom. It works because the breeds involved have been fine tuned to genetically mesh with each other during each step of the system. It all starts at the top with what are commonly referred to as ‘hill or upland’ sheep. These hill and upland ewes are typically the local or endemic breed to a given area or region, which survives well in its limited environment. These ewes are then bred to a Bluefaced Leicester ram to produce crossbred progeny referred to as “Mules”. The Mule is the backbone of the UK’s prime lamb production system. Fifty percent of all UK crossbred (commercial) ewes are Mules. 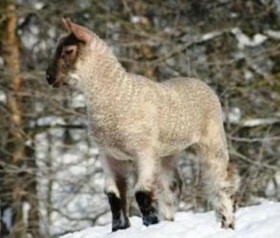 These Mules inherit the vigor and hardiness from their dams with the added benefit of an improved wool clip, increased size and capacity, prolificacy (some flocks exceed 200%), early maturity (it is common to breed the Mule ewe lamb in her first year) and milkiness from her Bluefaced Leicester sire. The Mule ewe lambs are either retained for the next step of the system, or sold off the farm in the fall at the livestock markets by the thousands. They are purchased to make-up large commercial flocks for the UK’s “prime’ lamb production. 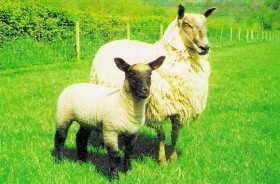 The Mule ewes are then bred to terminal sires, with the preferred ones being either a “British” Suffolk or the Texel. This third step in the system produces a carcass lamb that easily reaches market weights off milk and grass. The Clun Forest ewe is a hardy ewe with excellent mothering instinct and is a proficient and economical converter of grass and forages to milk and meat. Her crossbred Mule progeny inherit her qualities in combination with the excellent gains, increased prolificacy, early maturity, and improved handle and luster of the wool clip from their Bluefaced Leicester sire. In the Clun area of Shropshire the making of Mules is a popular and profitable side income from the purebred Clun flock. It is quite common to see Clun Mule flocks making use of small holding paddocks and pastures, and they are brought in to the local auction marts in vast numbers. Here in the States there has been an increased interest to replicate the UK’s 3-tier system. Breeders of hill and upland type ewes have acquired Bluefaced Leicester rams for Mule lamb production. They then either market the Mule ewe lambs, or in some cases complete the system by breeding the Mules to either a UK genetically improved Suffolk, or a Texel sire. This type of prime lamb is filling a growing niche in the specialty trade to restaurants, internet and catalog orders, the ethnic market and the ever growing demand by consumer for a wholesome, healthy, grass fed product.